Next up I found this cute Guest Cottage wooden sign. The lettering is not quite the styling I was hoping for but I figured I would bring it home and try it out since I had been hunting for one for awhile now. I think it is a keeper. Wait till you see where I put it. 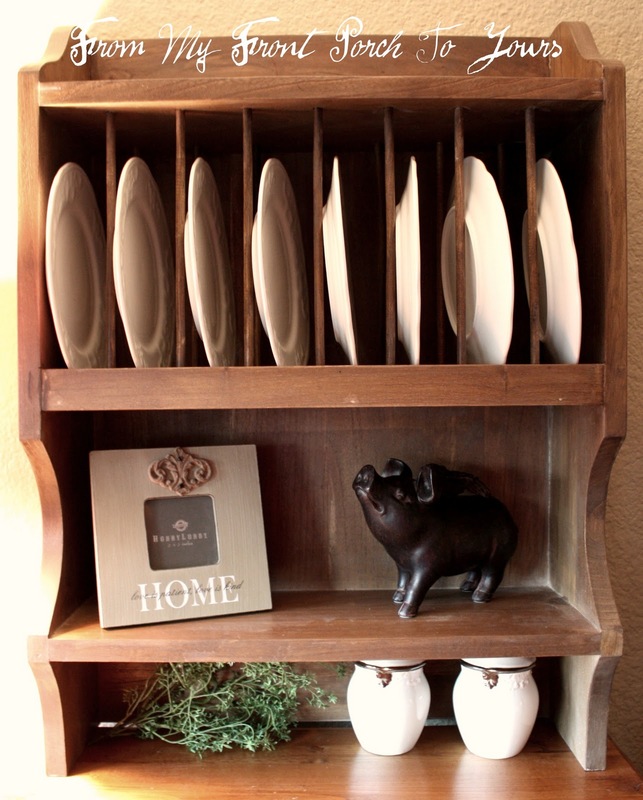 Next up I found this cute little plate rack and I say little because even though I thought it was big when I got it home it would not fit most of the dishes I had even the small ones. Hmmm, maybe why HomeGoods got them. I did though luck up and had some pretty little white plates that fit. I am still messing around with the decoration for it and the space it is in. I will share that soon as well. When I saw those precious pictures I had visions of them going here on the blank wall in the dining room but now I am torn. They would look fabulous going up our stairs with a mirror hanging in the middle as well. Decisions decisions! 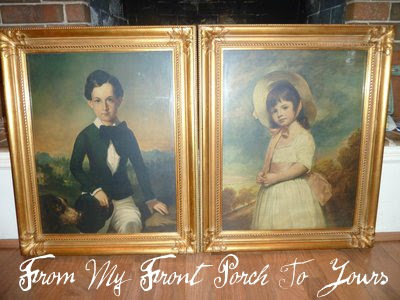 Also if anybody knows anything about those portraits please let me know. The gal who was selling them tried to research them as did I and we came up with nothing other than they are very old. The paper on the back of one was gone and on the other it was super thin and falling off from old age. So there are my recent treasures. Be sure to share your treasures for Treasure Hunt Thursday! Great finds, Pamela. I can definately see the tool caddy as something you HAVE to have. I sure wish we had a local yard sale site, that sounds like such fun! Great finds...and that's where I would put those pictures. Girl you did do good!! I can't wait to see how you display all these great finds! Love all your fun finds!! I think those pics would look great hanging any where they are fab. Yum-Yum!! Good stuff. LOVE the "Guest Cottage" sign. Can't wait to see where it lands. Love that tool caddy and the sign. I went to HG, too, but did not find anything except a dog toy for Bailey. Wow, you really did have a great shopping day..Just love the tool caddy..
Great finds! Makes me want to go to Home Goods. And, I've been trying to be so good! Those are great finds! I do a Thursday Shopper post and went to Home Goods too! Hop over and see what I found if you have time! You found some great stuff! I can see it jumping in my cart too! Have a great weekend! Love your finds. I would have picked up the sign too, love it. Those really are some excellent treasures. Thank you for sharing all of your HomeGoods finds!